Stepping inside Blessed Sacrament Church, a visitor senses the comforting blend of warm, welcoming religious tradition encased in contemporary building design. Simple, yet distinctive sight lines lead the eyes to the tabernacle and sanctuary cross covered with colored porcelain enamel mosaic and the beautiful altar made of crystalline white Georgia marble. Above and to the right of the altar, a tall stained glass window depicts the Last Supper with the Holy Eucharist — the Blessed Sacrament — at its peak. The original church concept for Blessed Sacrament was born March 2, 1926, when Archbishop Sebastian G. Messmer appointed Fr. Bernard M. Kobelinski as organizer of a church being planned to help fill the need for additional churches in the expanding southwest area of Milwaukee. Thirty people signed a petition requesting a new parish be created in the Jackson Park area. The site chosen at what is now South 41st Street and West Oklahoma was part of a farm owned by Wilhemine Fischer, whose frame farm home still stands on the nearby Alverno College campus. At that time, the farmland was part of the town of Greenfield. A lake on the church site had to be drained but because the area was so low, no excavation was needed. The entire basement of the original church was above ground. There was no city water, gas or electricity. A 265-foot deep well had to be dug to provide the needed water. On March 7, 1926, Fr. Kobelinski presided over Blessed Sacrament’s first organizational meeting and asked these earliest parishioners to place this great church building task under the protection of Jesus. He did so while standing and preaching on an old truck. Three months later, about 3,000 men, women and children attended the cornerstone dedication ceremonies. A Solemn High Mass was offered on a temporary altar erected near the church site. The plans for the eagerly awaited church-school building were drawn up by Mark F. Pfaller, a widely-known architect and the project was completed at a rapid pace. The completed church-school building was blessed Sunday, Nov. 20, 1927, by Archbishop Messmer. Thanks to generous contributions from neighboring parishes, the remaining costs of the new church were covered. But lean times were right around the corner with the 1929 Stock Market crash and the Depression of the 1930s. Parishioners rolled up their sleeves and sponsored bazaars, picnics, carnivals, dances and other events to keep financial pace. By 1940, Fr. Kobelinski left Blessed Sacrament to become pastor at St. Stanislaus Church and was succeeded by Fr. Leonard Sarnowski. Under Fr. Sarnowski’s leadership, Blessed Sacrament began to blossom. School enrollment increased. A new convent was built for the Sisters of Notre Dame who were teaching at the school. Plans were being drawn up for expanding the church and school building when Fr. Sarnowski suddenly passed away in 1950. Under the direction of acting pastor Fr. Thaddeus Dolata, the addition was completed in 1951. That same year, Msgr. Ladislaus Bednarski was appointed as pastor and under his stewardship, the original Blessed Sacrament was enlarged to include four parish offices and a school, and the building was redecorated. As the amazing growth continued, Archbishop Albert G. Meyer approved construction of a new church and rectory in 1954. The plans called for an upper and lower church with a seating capacity of 1,900. The groundbreaking ceremonies were held Sept. 28, 1954, and the church was completed at a cost of $750,000. The new church featured a stunning wall of stained glass measuring 37 feet high and 55 feet wide, and described by its designers as the largest stained-glass window in the world. It was dedicated to the Blessed Virgin Mary and portrays the story of salvation. 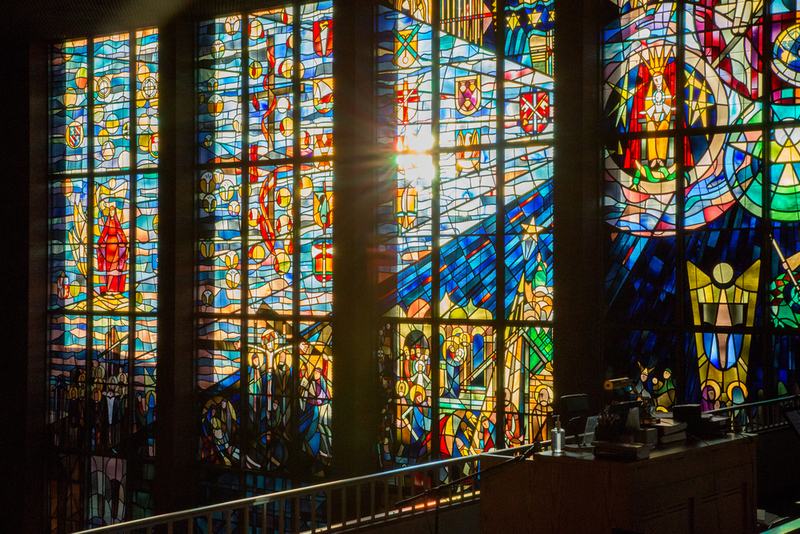 “When you take a look at the beautiful window, the highlight of the window is really the Blessed Mother as depicted in a number of aspects along with the parishioners, the Crucifixion and the Nativity of Jesus,” Fr. Payne explained. “If you look very carefully, you will see coat of arms from the different popes or archbishops that were reigning at that time. The new church was dedicated July 1, 1956, with Archbishop Meyer as celebrant. Naturally, the heart of any church beats among the people who come to worship. From the very beginning, the Polish immigrants who settled on Milwaukee’s south side were dominant in the congregation and that tradition carries on to this very day. With a soft smile, Forret recalls her earliest days at Blessed Sacrament.